Therapeutic justice is a process that attempts to address the family’s interrelated legal and nonlegal problems to produce a result that improves the family’s functioning. The process should empower families through skills development, assist them to resolve their own disputes, provide access to appropriate services, and offer a variety of dispute resolution forums where the family can resolve problems without additional emotional trauma. In re Report of the Family Law Steering Committee, 794 So. 2d 518, 522 (Fla. 2001). Just this past weekend, on July 1, 2017, Rule 4-1.19 of the Rules Regulating the Florida Bar went into effect. The Rule, concerning the Collaborative Law Process in Family Law, holds collaborative divorce attorneys to a higher standard than divorce lawyers who do not offer collaborative services. But for those of us who have been practicing this form of therapeutic justice, we have already been meeting these standards up until now on a voluntary basis. 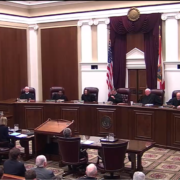 On February 9, 2017, the Honorable Laurel M. Lee, Circuit Court Judge of the 13th Judicial Circuit in Hillsborough County and Chair of the Family Law Rules Committee of the Florida Bar Family Law Section, along with collaborative attorney Robert Merlin, Vice Chair of the Committee and a Board Member of the International Academy of Collaborative Professionals, stood before the Florida Supreme Court (video) to argue in favor of the adoption of collaborative law rules of procedure and professional conduct. 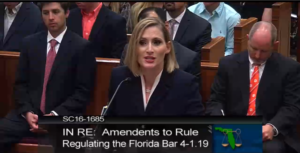 In 2016, Florida Governor Rick Scott signed into law the Collaborative Law Practice Act, but the Act does not go into effect until the Florida Supreme Court approves rules. The Act creates a framework for collaborative family law, which is a private form of dispute resolution where attorneys focus solely on helping clients reach an out-of-court agreement.